This Italian blues band chooses to record the Chicago blues from the 40s-50s era in true mono as the original blues ensembles practiced. The music is fine, but the aptly named singer-harmonica player Lorenzo “Mumbles” Albai’s often incomprehensible singing makes for one difficult listen. He brings Buhwheat from a Saturday Night Live sketch to mind as he sang-“You’re unce, ice, tree times a mady”. What adds insult to injury is that instrumentally they are one crack outfit led by “Mumbles'” fine harmonica chops. Kevin “Blind Lemon” Clementi’s guitar takes on mostly a backing role as he lends meaty support along with the occasional solo. The rhythm section moves things along quite nicely. All of the songs included here are covers of seminal blues artists. 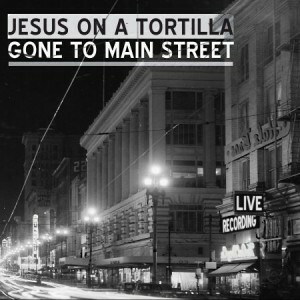 The unusual name is taken from various sightings of Jesus’ image burned into a tortilla. Go figure. One of the standout tracks is Walter “Shakey” Horton’s instrumental “Easy”, as there are no indecipherable lyrics to contend with. The harp blowing here as throughout the entire CD is top notch. The other instrumental, Little Walter Jacobs’ “Off The Wall” is superb as well. Strangely it is erroneously attributed to M. Jacobs. This band would fare better if they could find a singer that can enunciate. “Blind Lemon” delivers some nice Muddy Waters style slide guitar on Muddy’s “Standin’ Around Crying”. He also lends some tasty solos to Jimmy Roger’s “You Don’t Know”. What could of been a thoroughly enjoyable retro-blues record turns out to be an awkward listen that could of been easily avoided. I have nothing against accents, but there is a communication breakdown when one is straining to comprehend many of the lyrics. It’s a shame because the dedication and sincerity of the effort are heartfelt and obvious.